Our White Sage comes straight from California and is naturally dried and very good quality! White sage is available in both loose leaves (clusters) and sticks. 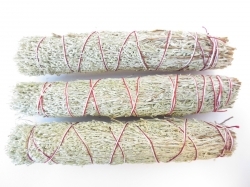 A smudgestick is a bunch tied together white sage that you can use repeatedly. Below you can find more information about the White Sage. 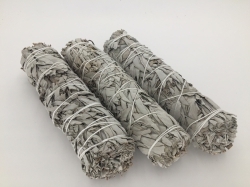 White Sage (Salvia Apiana) is originally from California and has been used for centuries by the Indians as incense used during purification ceremonies and prayers. White Sage is therefore called Indian frankincense. White sage is a strong cleaner. It opens the heart energy. 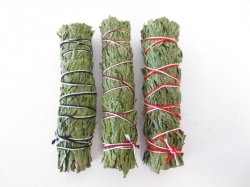 Sage is used in Native American ceremonies because the purifying force when cleaning the aura and the environment. It removes heavy energies. The burning of sage are also air, spirit and mind clean. Open a window when you go indoor smudging so that the energy can flow away. Sage stimulates visions and dreams. The leaves of white sage are known for their unique fragrance. White sage is usually burned in an abalone shell. The symbolism is that it unites the 4 elements: the shell represents water element, the sage represents earth element, the element is part smoldering fire, and the smoke is the element air.